Dogs have such great attitudes. They’re always happy, always hopeful, always up for anything. Maybe not ALL dogs, but most dogs – especially the ones I meet on the trail or at the beach or basically anyplace outside. We have one of those happy, hopeful pups. I swear she makes every day that much better with her wagging tail, sweet disposition, and general goofiness. People often ask what we feed Kaweah, because she has a shiny, healthy coat. Iams. We used to feed her regular Iams, but now she’s on Iams for “mature” dogs. However, her dog food doesn’t make her coat shiny. Genetics makes her coat shiny. Kaweah comes from good stock and we see that more and more as she ages. She’s been a healthy dog for her 13+ years. It helps that she’s got great muscle tone and isn’t overweight. Of course, given her druthers, Kaweah would eat 24/7. The act of eating a treat (or anything for that matter) is probably Kaweah’s favorite activity. So we try to maximize the joy by giving her little treats. She’s not smart enough to realize that five little treats are less than five giant treats. Store-bought dog treats are not inexpensive, so I started making treats for Kaweah at home. The good news is that they are way cheaper than store-bought treats and really easy to make. The better news is that she loves loves loves these treats. I got this recipe from my friend, Anita. When I saw her last fall, she gave me a little bag of homemade dog treats to give to Kaweah. As any self-respecting Labrador Retriever would, Kaweah gobbled them down with gusto. I mean, more so than usual. I had made dog treats in the past, but the dough was a pain to handle and I didn’t really like the recipe. Anita’s recipe is healthier and includes pumpkin, which is good for pups. This dough is far more forgiving and easy to work with. It comes together in no time with a stand mixer and it wasn’t too sticky. Now, I’m always doing something in the kitchen and Kaweah’s level of interest varies from complete obliviousness (when I make people cookies) to rapt attention (when I’m working with raw meat). Maybe it was the peanut butter, but she was on me like static cling from the moment I started making these treats. 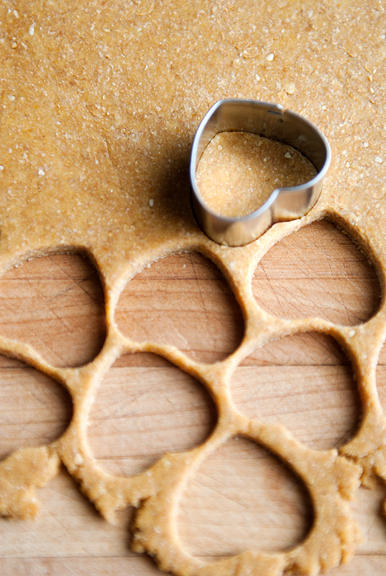 I chose a little 1-inch heart-shaped cutter for her biscuits. You can make them as big or as small as you like. Jeremy informed me that I could save some time by cutting straight lines in the dough with a knife. I looked at him, shocked and wounded, “But they TASTE better when they are heart-shaped!” I was kidding, sort of. I wad the scraps together, roll them out, and cut more hearts until there’s no more dough. The great thing about this dough is that it doesn’t spread when you bake it, so I was able to pack 50+ hearts on my baking sheet. They do puff up, but they won’t go melting into one another. A single batch yielded 100+ adorable, heart-shaped biscuits. 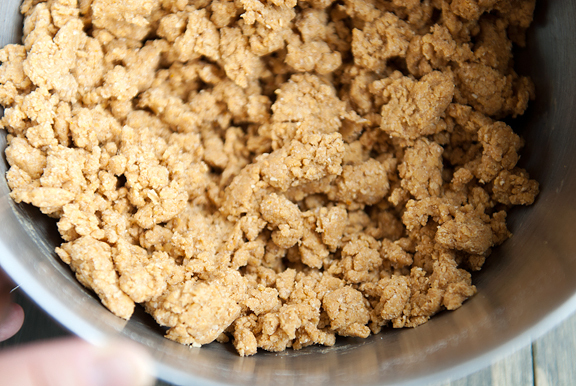 Anita bakes her dog treats to a soft and chewy texture. I want mine to be more durable to take on hikes and skis, so I baked mine for 30 minutes so they’d be hard and crunchy. These are Kaweah’s new favorite treats. For the first few days after I made them, she would walk up to one of us, make eye contact, then point her body in the direction of the pantry closet (where we keep her treats). If we moved in that direction, she would walk in place with anticipation in front of the pantry door. Crazy pup. Crazy, happy pup. Preheat the oven to 350°F. 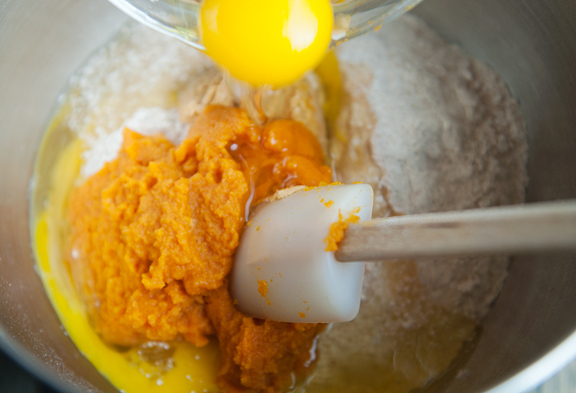 Place all ingredients in the mixing bowl of a stand mixer fitted with a paddle attachment. Mix on medium for about a minute or until the dough looks like a bunch of little dough balls. If you pinch a piece and it crumbles, add a little water. If it’s really sticky, it’s too wet and you’ll need to add a little flour. 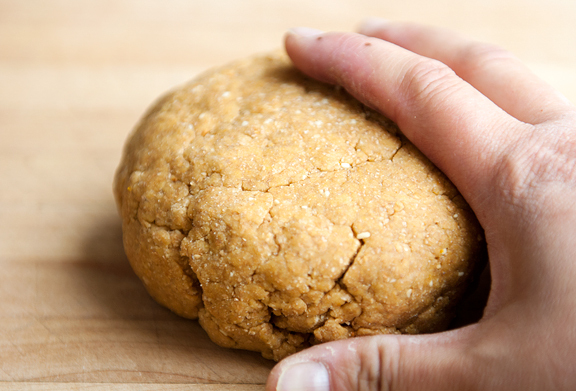 Gather the dough together and form into a ball. Place on a lightly floured work surface and roll it out to about 1/4-inch thickness. 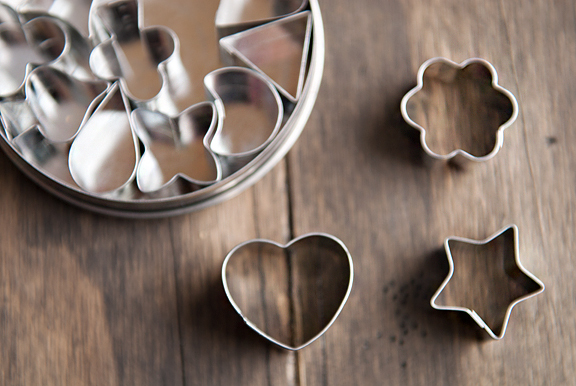 You can either use a cookie cutter to cut out cute shapes or use a knife to cut squares or strips. I am pretty sure the dog doesn’t care, but I rather prefer the cute shapes. I gather the scraps together and roll them out again and again until I’ve used up the dough. Place the cookies on a baking sheet. They can be crowded pretty close together since they don’t expand much. Bake 15-20 minutes for softer treats or 30 minutes for hard treats (Kaweah likes crunchy treats, just like her person – me). Let cool completely. 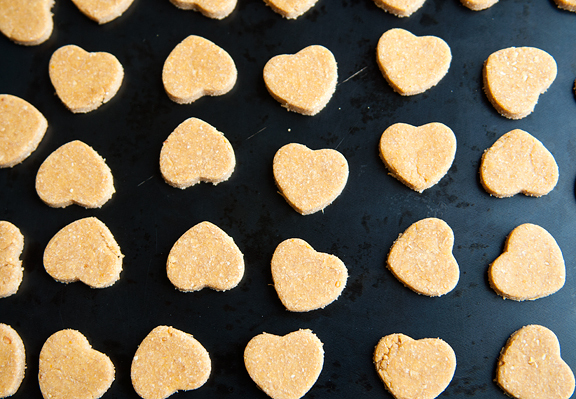 Makes 100+ 1-inch heart-shaped dog treats. Oh, she’s so beautiful…even if a giant stream of drool was about to drip from her mouth! I should check to see if pb is ok for cats. Sometimes pumpkin is recommended for, um, intestinal issues, and my mom gives it to one of her cats. But even if they wouldn’t work for cats, I can make them for my friend’s Golden Retriever. Thanks! These are adorable! I have a black lab/hound mix puppy who would adore these (of course, the lab part of him adores all food all the time), and I can’t wait to see the expression on his face when me baking yields something for him. Thanks so much for sharing (and for pictures of Kaweah – sweet girl)! Too sweet — the fuzzy pup, of course! And the treats look good. I’ve done peanut butter treats, but not pumpkin, will have to give it a whirl. I need to get back into this; much like people-food, I think most dog treats are oversized, at least if you’re buying based on the dog’s size. We end up breaking Indy’s snacks into smaller pieces, but making them ourselves, we could certainly control portion size easier. I absolutely love the happy dog photos. I can just picture the drool coming out of her mouth!! Yay, another post dedicated to Kaweah! I love that first photo of her rolling in the snow. 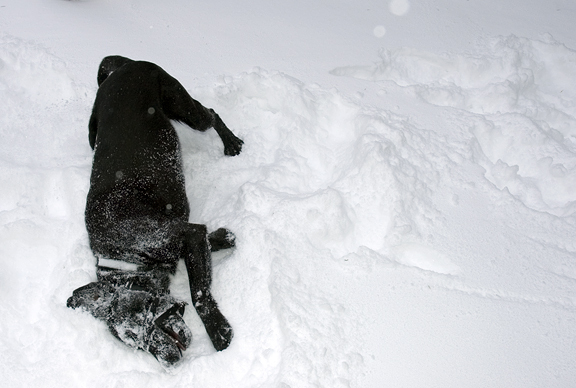 Before moving to Colorado, my older dog hadn’t really been around a lot of snow so it was hilarious watching him play in it. Seeing him rolling in some crunchy snow during a hike made my husband and me laugh so hard. I took a video and to this day it makes us smile, seeing him so blissfully happy. 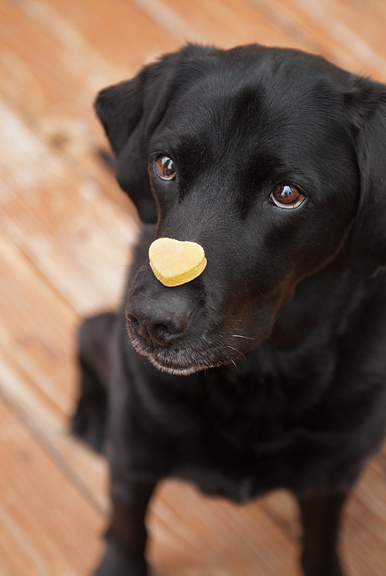 These treats look perfect and healthy, too, and our current pup will love them! She’s a peanut butter fiend. Kaweah is a beauty, for sure. I love me some Kaweah posts! Definitely an awesomely cute post that brought a smile to my face on this humpity hump day. I love your Kaweah posts and pictures. She has such a sweet pretty face! And she does have a super shiny coat. My beagle Ginger is pretty much the polar opposite of Kaweah – she is the fussiest dog I have ever encountered when it comes to food. I am not even kidding when I say I have pried her mouth open and shoved shredded chicken into it, only to have her spit it out! Ginger is a wonderful dog, but maybe a little defective :) She does like pumpkin and peanut butter (most days) and I know some other doggies who would gobble these treat up, so I may be making them soon! On another note, where did you get your cutters? I enjoy all of your posts, but the Kaweah ones are the best! I second Meghan, Kaweah posts are my favorite. That pic of her in the snow is too funny! I fed my dogs Iams for years thinking it was good stuff. Recently found out how many additives etc it has and switched to Canidae . Even though my dogs are older and have been pretty healthy (not to mention my position was eliminated a few months ago and so money is tighter than ever). But I like the idea of the first 4 ingredients and how important they are. And I get coupons (McGucks has the best prices around, amazingly). Kaweah is beautiful. Can’t wait to try the treats. I love her a crazy stupid amount. God, I really do. I’ll also pass these on to some friends who could use them. Great pup snack stuff. She is beautiful <3 reading your blog post instantly brightened my day. I love dogs, especially black ones. I'm off to make some treats! I love seeing your photos of Kaweah with her shiny coat and expressive, brown eyes. These treats look great for pups. How long do they typically last? Love this recipe! And so will Rider and Bear :) Also a great gift for the dog lovers in your life. Thank you! That photo of Kaweah and “the hand that feeds” melts my heart! Thank you so much for the recipe, Violet loved these last night. I have frozen half the dough (as she can be quite contrary) but I will soon be unfreezing it and making the rest. Any idea on how long they will stay fresh? I don’t know how to thank you for this wonderful dog treat recipe. I whipped up a batch for our 15 year old poodle last night. He was so smitten with the goodies, he took them to his downstairs bed and cried while eating them! This morning I let him eat 4! I baked them until crunchy because our dog likes a crunchy goodie! Thanks so so much for the EASY recipe! I think you made a lot of dogs happy today. And their owners! Kaweah is so beautiful! I hope my pup is in such good shape when she hits that age. I can’t wait to try and make these… my dog goes nuts for peanut butter! I just found this blog today and it’s terrific. The food looks good, but the writing is good, too. Love that. I am going to make these treats for my dogs, both of whom are 14ish years old, but neither is as beautiful as Kaweah. I love the name Kaweah; I have many fond memories of camping by the river of that same name. Such a beautiful pup! That last photo melted my heart. Hannah is going to love these treats. She 13+ years old? She doesn’t look it, we have a 10 y/o lab mix and she has a white muzzle and eyebrows I always joke that she got into the powdered sugar. I tried the dog treats and they were a hit with our dogs and I even gave a few to our horses and goats. I just posted it on my blog. Found you through Pinterest and I love your blog! Can’t wait to make these for Jerry “the” Springer. oh my! that last photo of her is pure love for you on her part–i am going to make these for Jax. thanks again for another post of your beautiful girl! enjoy the snow–it’s supposed to be 87 in san ramon today. Kristin – thank you! She’s a sweet girl (looks, no brains). Pumpkin is supposed to help dogs with bladder control issues too. Ananda – thanks and yay for your doggie! Theresa – WOW! That’s unheard of in this house ;) Kaweah wants you to shove shredded chicken into her mouth. She really does. Oh, and I got my cutters from a local gourmet/cookshop in Boulder called Peppercorn. They have great stuff, but they can be on the pricey side (http://www.peppercorn.com/). penny – I know Iams isn’t the best, but we’re also reluctant to switch foods on her since it seems to cause issues. Some other brands give her gas, turn her coat brown, or make her poop runny, but I’ll keep your rec in mind. Thanks. micka – the great thing about making treats for dogs is how they don’t care what it looks like! Kelly – I have no idea. I’m guessing they should be good for at least a month. Kaweah gobbles them up faster than that. I’m sure if you’re concerned (especially if they are the soft kind) you can chuck them in the freezer for longer life. Pru – oh wow, that’s great! I think if you bake them hard, they will last at least a month. If you bake them soft, maybe a week or two? You can always freeze them as I told Kelly. Amie – oh, sounds great and I hope your pup(s) likes them! This is How I Cook – ha ha!! Victoria – thank you. Sometimes we forget that she’s a senior citizen because she still looks so puppyish. Margie – I love happy dogs! MPD310 – ha! What an awesome name for your pup. I usually don’t leave comments, but I just had to for this! First, Kaweah is beautiful! I can only wish my dogs would stay still long enough to take really great pictures. Second, thank you for posting this! I’m so excited to make these tomorrow for them! It looks so easy and I love that I already have everything I need. I don’t know if it’ll help my case to keep the six of them out of there when I’m cooking, but if they love them (which I’m sure they will), it’ll definitely be worth it. Made these this weekend and posted about them on my blog today! Hobbes LOVED them!! thanks! Note on dogs and peanutbutter. My dog, Icelandic shepard, loved peanutbutter flavoured goodies, hazelnuts, which she shelled herself, walnuts (ditto) etc. Unfortunately, I think this was what gave her an allergic reaction. She was scratching herself all over, all of the time. Vet had no idea, but when I stopped giving her nutty-things, it stopped immediately. I was sorry for her but no more peanutbutter goodies from then on. I have 4 dogs,2 labs and 2 Shih Tzu’s and dog treats can be very expensive and unhealthy.These are perfect! They all scarfed them down and begged for more!Thanks,I’ll be making these often! Shirley – If you live in a humid climate, then you will want to store them in an airtight container in the refrigerator. I doubt they’ll last longer than a week or so. Perhaps you can freeze them? I found your blog via Pinterest. I loved the picture of Kaweah and wanted to make these treats for my two Labs. Hubby lost his job and we are economizing wherever possible. I wonder whether I can use mashed butternut squash in place of the pumpkin.Our Babe will be 11 in October, and she is very healthy yellow lab. Cooper is a 5 year old cream-colored lab who is still very much a puppy. They LOVE to eat but we watch their weight. Anyway, I am going to try these treats. They sound really good and really easy. Thank you so much! I just made my third batch of these treats. So easy, and I am usually a hit-or-miss baker with most things. I used mashed cooked coolled butternut squash the first time, and they came out fine! I don’t have a small cookie cutter, so I used the rim of a very small cordial glass to make rounds that were about the size of a quarter. This time I had pumpkin on hand so I used that. A little goes a long way. We keep these in the fridge in a Tupperware container, and our dogs get them when they come in from potty breaks. Our dogs LOVE these things! I made this same recipe just last week but my recipe only calls for 2 Tbsp of peanut butter. I made them for my little man “Ivan” my 11 yr old pekingnese and “Izzy” my niece dog a minature italian greyhound. My sister-in-law said ” Izzy loved them” and of course Ivan told me he loves them too. I am planning on making a double batch in the next few days so I can make my nephews three labs some of the big bones. Nothing better than baking for my favorite dogs………very rewarding!! Hi, The treats were a Big Hit. They are all natural and the problem I have found after cooling them and placing them in baggies. They Mold after a day or two, we had our puppy party Sunday and I bagged some up for friends that couldn’t make it and by Wed. they were molded? Shmoe – I think you either have to store them in the refrigerator if they are the soft kind of dog treats, or else bake them until they are hard and have no moisture (even then, if you live in a humid area, you may have to store them in the refrigerator). Where I live, it is crazy dry – like 10% humidity – but I still bake them hard/dry. Good luck! I made these treats over the weekend at the cottage and all the dogs, all 5 of them, LOVED them. I have since given a few out to friends and co-workers for their pups to try! I’m sure they will love them as much as mine do. I used a 3 inch cookie cutter in the shape of a bone and I was able to get 37. Although I think I ma have rolled the dough out a bit thicker than what you had suggested. Thanks for the recipe – it’s definitely a keeper! I do not have a mixer, will it work to hand mix for a longer time…. Looks great! Can these be made with regular flour as well? Kris – I’m not sure. My guess is yes, but I don’t work with whole wheat flour enough to know the difference in how the two behave. Maybe try a half-batch with regular flour first? OMG Thanks for posting this!!! Made this today for my parents’ puggle! She’s devouring them!! Thank you!! could you use all purpose flour instead of whole wheat flour? I found your recipe while searching Pinterest for doggie treats. These are so easy and my kids (4 & 8 are having so much fun making them! Thanks so much for posting. Emily – I’m sure you could, though I’ve never tried it myself. I just finished baking these for my handsome fur baby and he LOVES them!!! Thanks so much for posting this recipe – 2 paws waaaaaay up from Atlas (and he definitely thinks I’m the coolest puppy mama ever)! Thank you for this recipe! My pup, Koya, absolutely LOVES them and they made great poochie gifts during Christmas. :-) I’ve posted the link to this recipe on Koya’s facebook page http://www.facebook.com/thedailykoya. Also, she never use to let me trim her nails, but with these biscuits, she just laid there and let me clip away while she was munching on mini biscuits. :-) That is a sign of an awesome dog cookie for sure. My black lab Rook absolutely LOVED these! I found using just 2 cups of flour worked a little better for me. Thanks for sharing this great recipe! Debbie – Hrm, it sounds like you didn’t quite go by the recipe since you subbed brown rice flour in for the whole wheat flour. My guess is that there was no gluten in the dough and gluten in the whole wheat flour makes it develop into a nice, smooth dough. Perhaps you could try googling for some gluten-free flour substitutions (I know my friend Shauna, at glutenfreegirl.com has developed A LOT of GF flours). Good luck. These look wonderful. I hesitate when buying teats for my dog, because you hear of so many things going wrong with what is in the store bought treat. I will def make these for my pup. Thanks!! Hi there! I’m really excited to try these. Do you know if there’s anything I can use as a substitute for the eggs? Thanks! Laura – not that I know of, but I’m not especially knowledgeable when it comes to substitutions. Perhaps look online? 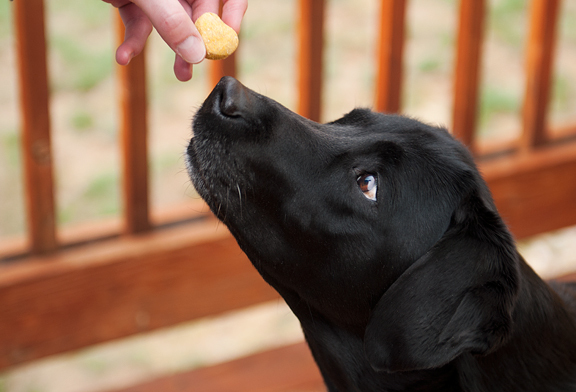 Do you know fat content per treat? My Archie has had pancreatitis and we have to keep the fat content low per treat! Kelly – that kind of depends on the size of the treat. I haven’t calculated it – but it shouldn’t be hard for you to do. Hi We had a baby boy we named Giz-Moe a beautiful rat terrier. This past June he lost his battle with diabetes that we were the cause of because we basically feed him ALL the wrong foods mostly table foods. He did eat dog food but he just loved all the handouts and knew how to work those big brown puppy eyes and it worked every time. He was blind and needed 15 units of insulin 2 times a day with a prescription diet every day. He lived a very long and happy life because we promised him that. But my point is be very careful in what you feed your furbabies and don’t make the mistake we did. I will only feed my babies a food called ” 4 Health” it is found at our local tractor supply store and it’s just as good as the real pricey stuff called Blue… I did the research on dog foods for our new furbabies because I flat refuse to make the same mistake again with any more furbabies. These guys are my kids and I love them dearly. I made the pumpkin peanutbutter treats for them today and they absolutely went nuts for them. I tried them too not bad (needs sugar and cinnamon for me) lol but tbey loved them. Thank you for a healthy low cost treat for my babies I will be leaving store bought treats at the store. Thank you so very much! Hi. Kelly thats what my Gizz started with was pancreatitis which lead to diabetes so please for Archie do indead watch his diet very carefully. Gizz recovered thank God but it destroyed his pancreas and thats what happend. Alot of folks dont know that sometimes we do more harm than good by giving our furbabies people food. But really its so incredibly bad for them. Thanks for listening. I just dont someone else’s babies to suffer like my Gizz did. Do you have to use whole wheat flour or can you use all purpose flour? Ashley – all-purpose has less nutritional value, but it will also behave differently as far as liquid content goes. I don’t think you can substitute 1:1, but you can look up conversions on sites like King Arthur Flour or call their baking hotline for help. Found this recipe on Pinterest. Holy moly do these make a large amount! I’m just throwing the extra in the freezer to keep and giving some to dog family members :) Great recipe and easy to do! Pretty sure my dog is going to LOVE these! Can you substitute yams for the pumpkin? Labs can generally have an allergy to wheat. 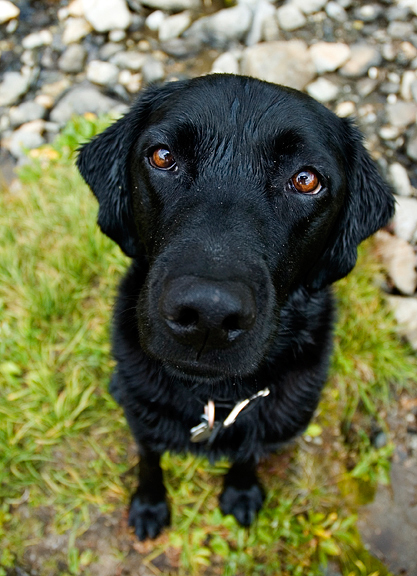 If your dog scratches a lot and has dry skin cut the wheat, soy and corn out of his/her diet and it may improve. 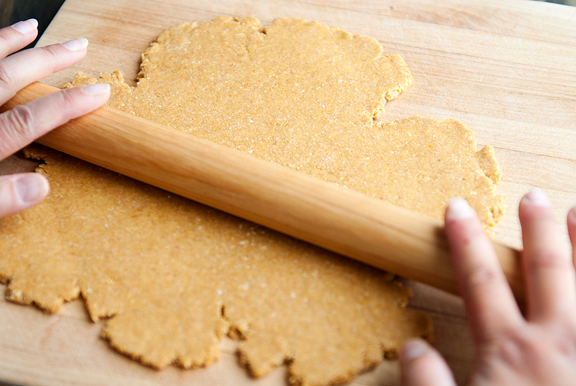 To sub a different flour 1 cup wheat = 3/4 cup oat flour, or 7/8 cup rice flour for gluten free. Do these need to be refrigerated? How long can these be kept before they should be thrown out? 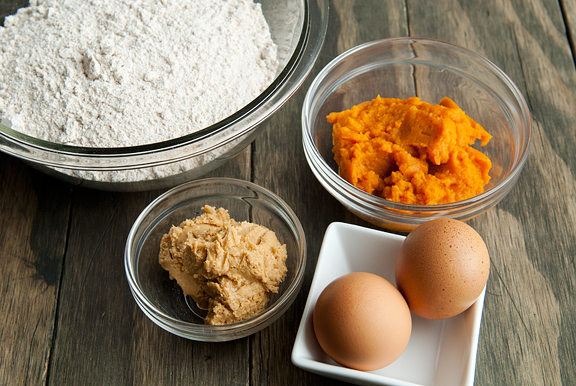 What is the best gluten free flour for substitution? Gluten gives my Emma seizures. Thank you! jill – if you bake them for 30 minutes (until they are hard) then no, you shouldn’t need to refrigerate them. If you bake them until soft, then refrigeration is a good idea. I don’t know of the best GF flour for substitution. You might have to google about that for that. 1) can you use all-purpose flour instead of the whole wheat? 2) I don’t own a mixer of any kind, so I would have to mix by hand. any suggestions like how long or what to mix with? 3) the recipe says 2 large eggs, what would the difference be if using regular eggs? my family has 5 dogs so i would rather find something healthy like this compared to the big store brand box my mom gets. Trisha – sure, you can use AP flour, although it’s not as healthy and it may behave a little differently. If this is your first time baking, I would probably stick with whole wheat flour (it’s not hard to find at the store). You’ll have to mix by hand which will be rather strenuous (but possible if you’re relatively strong). I suggest putting it in a very large bowl so you can sort of knead the dough together without having it all topple out of the bowl. If you mean medium eggs, then you probably want to use 3. I don’t know what “regular” eggs refers to. Good luck! I made these last weekend. My 3 dogs love them. I tried them too, very tasty. Oh, & I used just plain flour. I cut mine with a pizza cutter, much quicker. Hold back a little on the flour & add as needed. Makes heaps. How do you store them. I choose to cook for 20, silly on my part because after you make 100 and give some away, you still have 75 left and they don’t store very well for 2 dogs! They were moldy! I love this and will cut it into and cook for 30 minutes but should I place them in a closed container or what?? Lea – you can store them in the refrigerator if you choose to make soft ones. If you bake for 30 minutes, they should be fairly hard. I usually leave them out on my counter overnight to fully dry out, although I live in Colorado where our humidity is nearly non-existent. If you live in a place with humidity, then try keeping the biscuits in a 200°F oven for another 30 minutes to an hour? If you press the centers, and they are hard, then they’re ready. When cooled, I place them in a tupperware in my pantry. Other recipes I have tried call for Parsley for breath & vitamins….what do you think about adding fresh Mint to this recipe? If so…how much fresh mint would you add? I have a Siberian Husky, a Chihuahua & a Jack Russell Chihuahua mix….I made a recipe similar to this one [minus the pumpkin] and it had parsley & pb in it as well as the wheat flour, milk…no eggs. I want to stay consistent with your recipe posted, but was wondering about adding the mint. I’m going to make a batch w/parsley [2TBSP] as it is good for their breath & while aiding in digestion, parsley is also high is vits A&C, my pups didn’t care it was in there and I’ve already noticed a difference and it’s only been a week they have been eating all natural treats. I will never buy store/processed treats again! Please let me know your thoughts & TYSM for this recipe! I’m ready to get my hands “dirty”! Melissa – I think you can add whatever you like to the recipe. It’s not terribly finicky. Good luck. Wow! I made these for my babies a couple of times now and they LOVE them! They sit in the kitchen at my feet while I’m making them. I also gave some to friends for their babies to try and they loved them too! Thank you so much for sharing!! Hi, I found your recipe from Pinterest and was eager to try it as it seemed very easy. I just made these this morning for my 3 dogs and they absolutely LOVE them. They have already had two each and are circling my chair as I type this looking for more LOL. Thanks so much for sharing this recipe! My first attempt at making these treats last night was a total success–my Trixie loves them. I made a second batch today (first batch was cutting them into 1/2″ squares using a pizza cutter, second was with a 1″ heart-shaped cutter) to give away to friends. I also calculated calorie/fat information based on the ingredients I used, for anyone interested. I was able to get 105 1″ hearts, so my larger treats are approximately 14 calories and .4 grams of fat each. Make these for all of our Labrador Elsa’sfriends for Christmas presents. Found a bone cookie cutter. She is a popular dog in the neighbourhood. This sounds wonderful! Ready to make them for my Babygirl. What temp did you preheat your oven to? Thanks! Tia – it’s in the recipe! Thank you for this recipe. I just made them for my dog and he seems to like them. His friends in the dog park will be munching on them too. Thanks again! My dogs loved these but turned moldy within a week. Didn’t see anything I. Your recipe about keeping in frig. I made double batch so all my hard work was gone and the dogs were sad. Should they be kept in the frig and freeze second batch? Very glad to know that we have something in common-I’m also always doing something in the kitchen and want to research another new recipe for my dog. 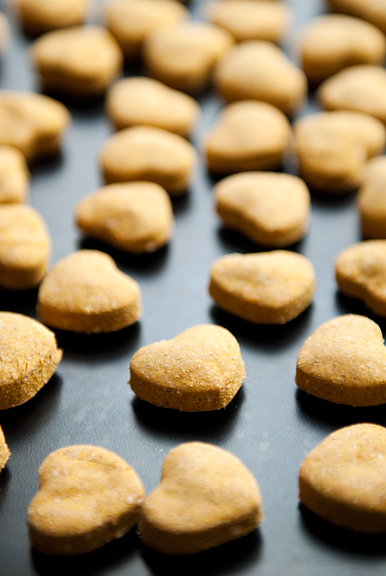 I love your recipe and feel easy to make this homemade dog treat. Finally, I wonder how long they can be stored if I place them in a closed container or something else? Paige – most things that are moist should probably be stored in the refrigerator (or even freezer) if you want them to last more than 5-7 days. Even in super dry Colorado, our soft treats mold after a week. Or you can make them crunchy (hard) and those last forever. Myfoodie Pet – If soft, they can be stored 5-7 days depending on your climate (humid or dry) before turning moldy. I would store soft ones in the refrigerator or freezer. For the dry ones, they last pretty much until they are all eaten in a closed container. I featured these on my blog this week (with proper link back to your post)! Thank you for such an awesome recipe! Keep them coming! I made these yummiful treats for my dog and friends dogs, they were a hit. then used Greek Yogurt with Peanut Butter to draw on the pads of their feet. I wish I could upload photos they were too cute. The dogs loved them so much their human even tasted them. I made these today for my 3 dogs. They turned out great! I had so many that my daughter took some to our neighbors for their dogs. I write a monthly column devoted to canine culture for our local Salida, CO paper The Mountain Mail and sometimes share dog treat recipes. May I use this recipe and give credit to you? I love the easy, tasty recipes wit ingredients dogs love. Even if I can’t reprint this recipe, I will be making them for my golden and my Lab/Beagle mix. If you’re okay with this, how would you like the credit line to read? Judy – totally okay and just refer them back to userealbutter.com (or link to the recipe). Thanks! nikki – they can be soft or hard depending on how long you bake it (as stated in the recipe). How long would harder treats last? I am with a rescue and we are having an adoption event that I am going to sell treats at. I want to make more durable treats, if I did how long would they last in a container? I plan to make them for a rescue I work with for an adoption event. Stephanie – if you dry them out completely, they last for a month or more in my dry climate. That said, if you’re in a humid climate, you’ll have to take that into consideration. It is great to see Neva’s progress and growth. can i put rice flour instead of wheat flour thank!!! marie-pascale – oh, I have never tried that, but I have a feeling it wouldn’t work out too well. Perhaps you could make a small batch to test it, but I have a feeling it wouldn’t have the right texture. I must say you’re a very patient person! I’ve read each and every post and came across the same question multiple times! And you patiently answered each duplicate question every time! I only have thanks to give, I look forward to trying this simple recipe for my Charlie! I found a new way to get a crispness in the cookies no matter what the other ingredients! Substitute any flour for Rice Flower! it has produced crispiness in all the rolled cookie dough recipe I’ve made. Can all-purpose flour be used? Jill – I’ve never used it, but you can certainly try. Or perhaps do and half AP and half WW flour blend? The moisture of the dough may differ, so add more flour if needed (or add another egg if it’s too dry?). It was my first time making my own dog treats… I just made these and my 6 month old pup LOVES them! Thank you for the recipe! Thanks for these! We made a batch two weeks ago and are making another tonight! I made them with AP flour because we don’t eat carbs and we just happened to have some leftover AP hanging around. I followed the recipe and had to add about 1 TB or so more of flour since the dough was a little sticky, but the recipe says that can happen anyway. They turned out great and our bulldog loves them! I’ll probably get WW flour eventually just to have something healthier for her, though. Oh my goodness. These were awesome. My furbabies absolutely flipped for these. I actually had to lock my lab mix out of the kitchen because he literally was sitting in front of the counter they were on and staring at them even after I left the kitchen. I ended up making two more batches to give out as Christmas gifts to all my friends who have furbabies too. The dough was an absolute dream to work with. I did put some ground ginger in there for them too because it is super good for them. Thanks so much for this recipe! This is my new go-to dog treat recipe now. I used to give these treats to my diabetic lab mix. I used the whole wheat flour and natural peanut butter (No sugar). She absolutely loved them. Baking till crunchy gave them a very lengthy shelf life in an airtight container. I make these. My dogs love them. They will turn their nose to other treats when i have these in my frig. These are the best!! By far!!!!! !